This year I was more than happy to tackle the decor for What’s Your Beef. You may remember the inspiration board from last month, when a lot of the crafts were just rough plans. I didn’t quite know how a lot of the elements would turn out, but I’m pleased that almost everything ended up just how I envisioned. 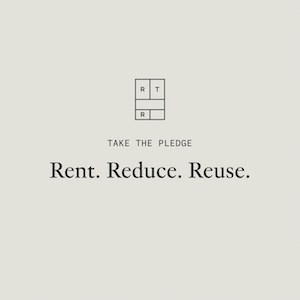 What a fun event (and good cause) to create for! I tried to think about different things we already had in the building or that we could get easily and transform quickly. We have a lot of wine tasting and cooking classes, which each use a few bottles a night. Asking staff and instructors to save a few bottles here and there, we quickly had a collection. 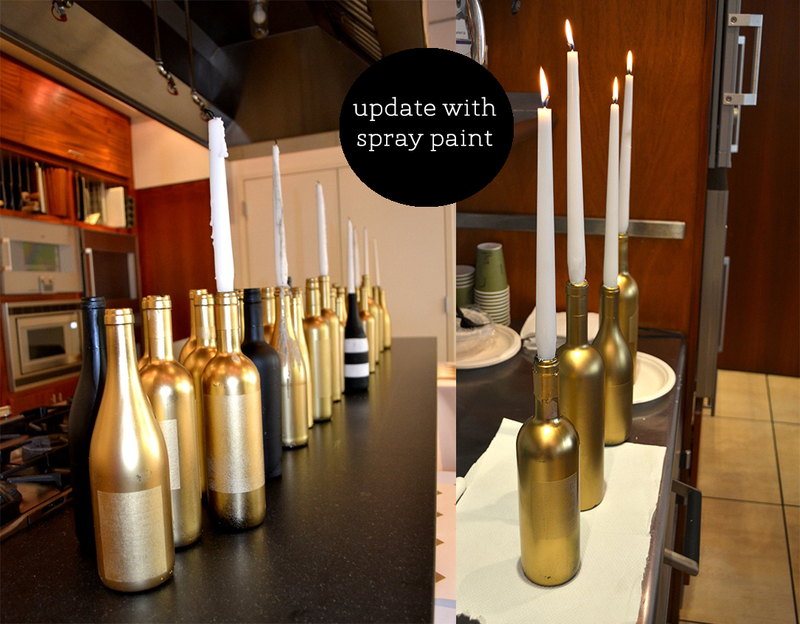 Everyone on staff helped out with the spray painting — and in the end we had about 200 bottles. They were used in a couple areas around the building and several in the Chef’s Table room became makeshift candelabras. We stuck with simple centerpieces which added a touch of green (and smelled wonderful!) 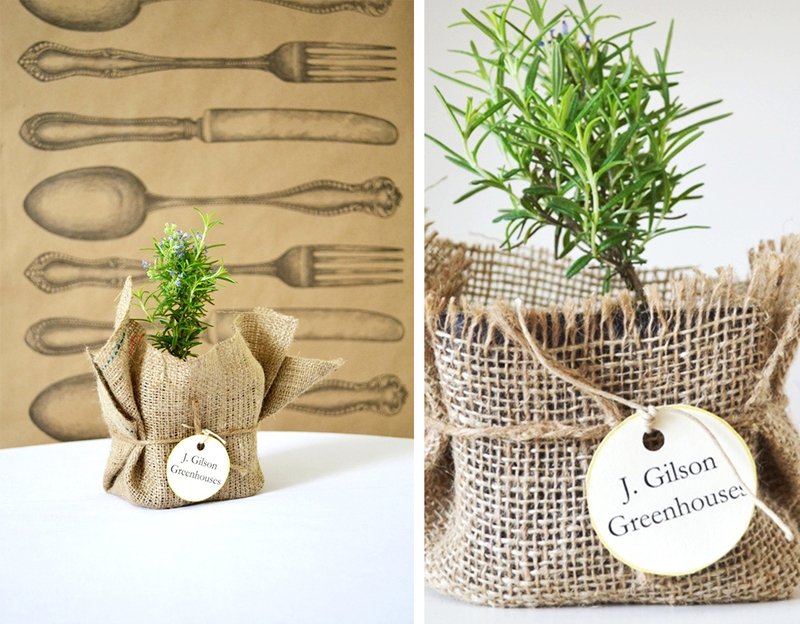 Potted rosemary plants wrapped in burlap and tied with twine were the perfect pop of color. They were very generously donated by Jodie Gilson of J. Gilson Greenhouses. The highest level ticket holders at the fundraiser had access to the Chef’s Table. 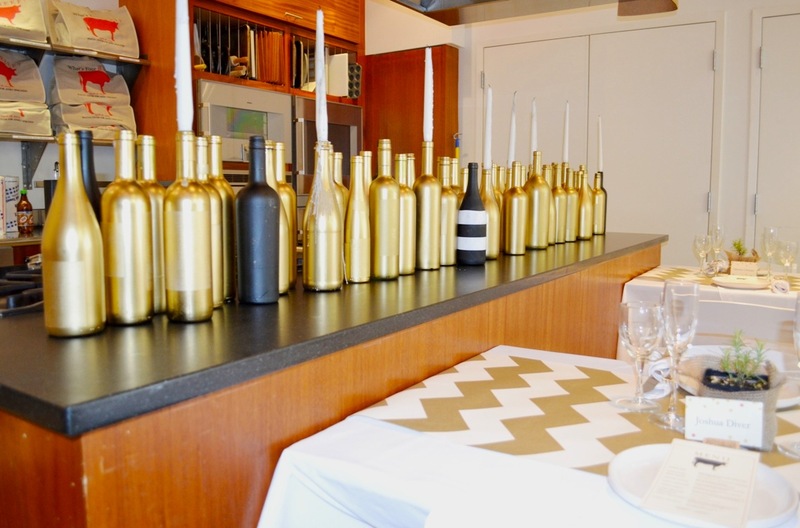 Inspiration for this room started with a roll of gold chevron paper from Papersource. At $30 a roll (50 feet) it was much cheaper than fabric runners and an inexpensive way to upgrade the room. A paper runner also makes for very easy clean up at the end of the night! 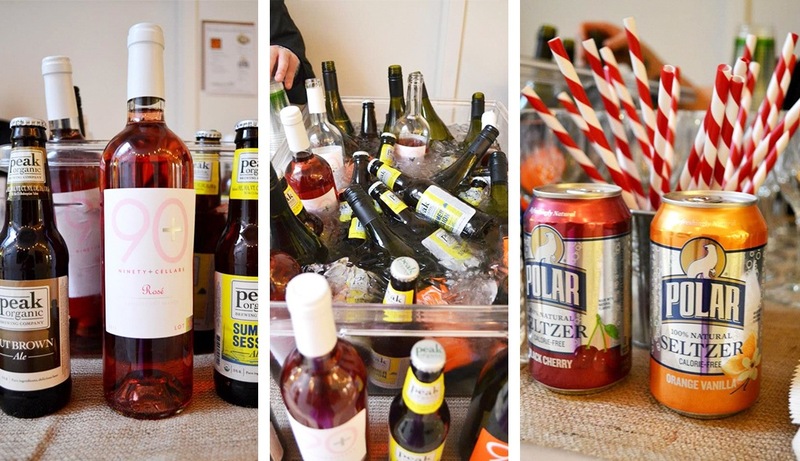 Thanks to Peak Organic, 90+ Cellars, Sons of Liberty Spirits Co, and Polar Seltzer, no guests went thirsty. Don’t you love Polar’s stripey straws? There were also high top tables throughout the building where guests could stop to enjoy their dishes and socialize. The tables needed a little something, but it had to be small so there would be room for plates and drinks to get set down. Small mason jars (about a $1 a piece), with added black ribbons, and filled with beans and wheat, were did just the trick! 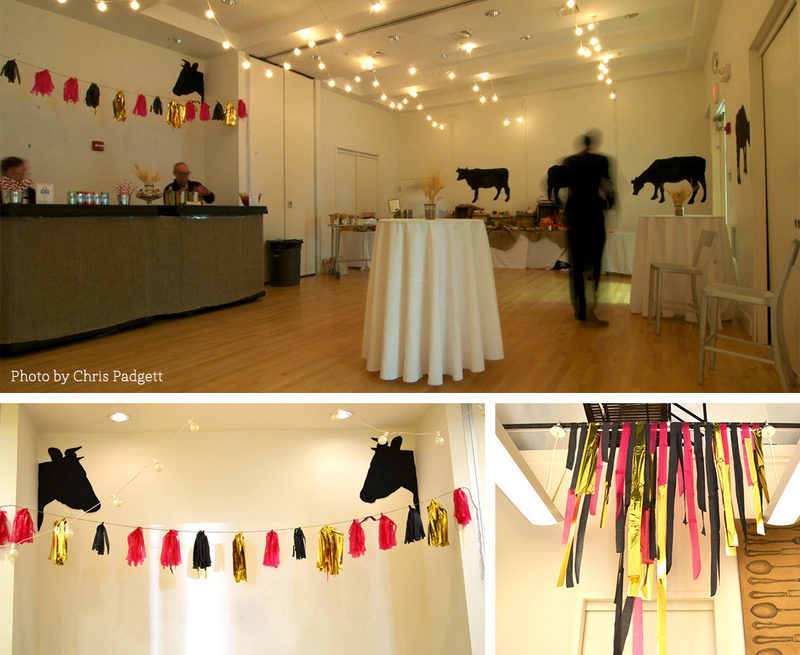 A giant roll of contractor paper was transformed into cow silhouettes and sheets of tissue paper became tassels. I thought they looked a little bit like cow tails and were a cute touch. To make the silhouettes the paper was taped up on a wall, the image placed on a projector, sized and then traced. I’m a huge tissue paper fan. It has the potential to become a lot of different things and is another way to add a lot of decoration for very little money. Another great touch was the #WhatsYourBeef13 hashtag installation. I hijacked this idea from the 100 layer cake archive and can’t find the exact link now. We wanted guests to be as engaged as possible on social media during the event, and this made sure that everyone knew what the hashtag was. The piece was pretty simple to make and requires just nails and yarn. The other really cool thing we did this year was to project a live instagram stream of the event (I used eventstagram). As long as a guest added #WhatsYourBeef13 into the caption of their photo, it would automatically get added into the stream. 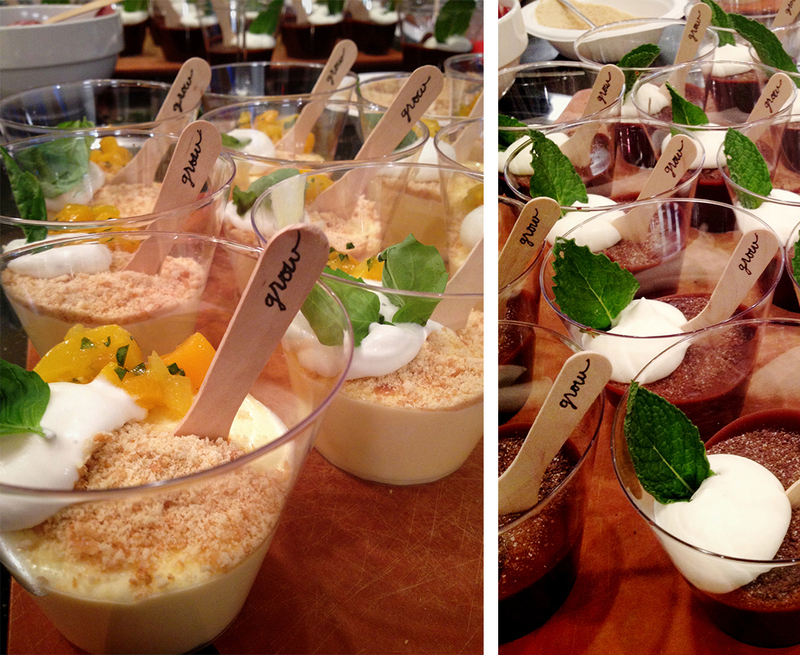 The night ended with Dustin Rennells’ “potted puddings.” He made two flavors – Vanilla custard with peach and basil and Chocolate custard with mint. We added wooden spoons, meant to look like garden markers, with the word “grow” written on them. I think I ate 4 of these on that night alone! If you want to see more photos from that night you can browse the facebook album. 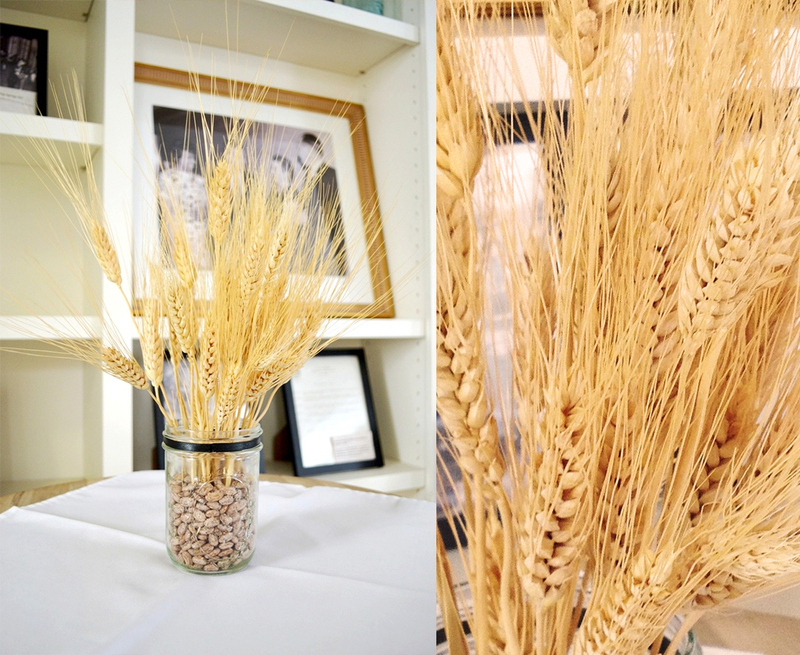 And if you ever want to talk event decor — I’m your girl! A shout out to our incredible chefs & sponsors! Chris Padgett of Little Monkeys Photo Co. Thank you! I love this time of the year when crafting becomes a part of my full time job. Great job Becky – looks fantastic!